Can Rabbits Eat Pear Tree Branches? Pear tree branches are great for rabbits to eat. This is because rabbits love the taste of fruit tree branches. 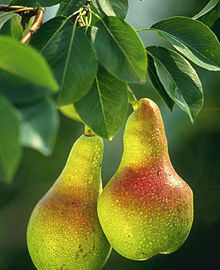 Pear trees often appear in gardens and back yards and are a good way of giving your rabbit something nice to chew on to grind their teeth down. So can rabbits eat pear tree branches? Yes they can and are absolutely fine for rabbits to eat and chew on. The only tree branches that they can’t eat are from stone-fruits such as apple, plum, cherry, apricot and other types of stone-fruit. Rabbits can also eat pear tree leaves which they will love and tuck into.